I’m fortunate to be married to a man who has also made the discipleship of young people his mission, and we are working together on making discipleship parenting the main focus of our lives. 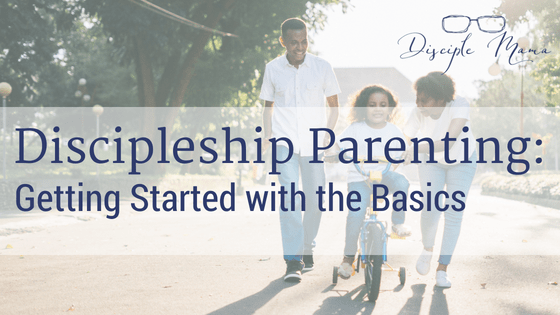 Discipleship parenting is loving, listening to, and following Christ, and, in turn, living a life that leads your children into their own meaningful relationships with Him. 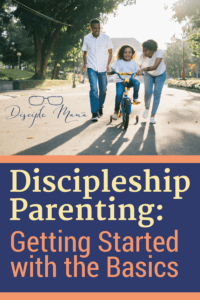 Why is discipleship parenting so important? Have you heard about how teens and young adults are leaving the church in droves? Yeah, of course you have. Here’s the thing: I suspect that many of them are leaving because the church is not something they really feel is theirs. So, for my kids my husband and I are doing our best to focus on leading them into a relationship with Christ. We want Him to be their best friend, because if He is, they are much less likely to leave Him. The thing is, it’s best to start as early as possible. In fact, according to the Barna Group, kids’ moral standards are basically in place by age 9, their beliefs about Christ by age 12, and they pretty much believe what they’re going to believe spiritually for the rest of their lives by age 13. (Read the article here.) 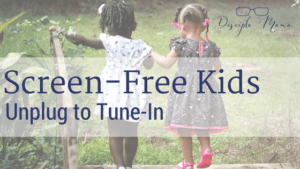 Babies and toddlers are not too young to begin viewing Jesus as their friend. Of course, if your kids are older they can still form a strong relationship with God; it’ll just take more intentional special care and attention. It’s never too late to start. Character building Building Christlike character is one of the most important things parents can help their children with. 1 Timothy 6:11. Physical health/Time in nature 1 Corinthians 6:19. ’nuff said. These areas overlap somewhat and cover a multitude of tiny little tasks and nuances of daily life, yes. 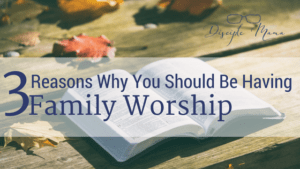 But being intentional about incorporating something from each of these 6 aspects of a healthy Christian life into the daily business of parenting will make a difference. Choose one (new) thing to start with and practice it until it’s permanent. If you’re having trouble thinking of simple ways to incorporate the 6 essential target teaching areas into your daily routines, I can help. 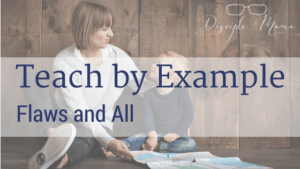 I’ve put together a list with kid-friendly activities for each category, which can be yours if you sign up here! Remember that discipleship is more about a relationship with Christ than anything else. Focus on Him, and the rest will, over time, fall into place. The things we do should, ultimately, just be products of who we are in Christ. Thanks for spending time here at Disciple Mama! Hopefully we’ve got you thinking about how to step up your discipleship parenting game. If you’re willing to share your thoughts, leave a comment below! Please stop by and visit again soon. Or, even better, sign up to receive newsletters with new posts and bonus information straight to your inbox! What an amazing ministry you have here! I absolutely love your blog. I found out about it after your post in the Adventist Bloggers FB page. I love how practical your tips are and can’t wait to apply them someday when my husband and I have kids. Thank you so much, Aiane! I’m so glad you like it! This is exactly the kind of parenting resource I have been hoping existed. Thank you! I’m glad you like it, Emily! !